Heavy construction for greater mechanical strength! 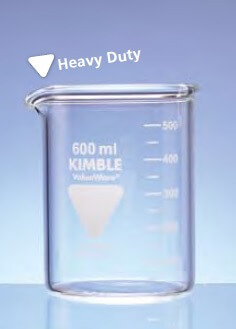 These Kimble beakers are made from borosilicate glass 3.3 and have thick, uniform walls throughout. Extra thickness is built into the heavily beaded rim. Spout is designed for optimum performance. Heavy construction is intended to prolong life expectancy with harder than normal usage. Not recommended for use on hot plates where significant thermal gradients exist due to lack of agitation of contents or absence of a temperature control. All sizes have a durable matte finish marking area and a white graduated scale for measuring and/or mixing liquids where a high level of accuracy is not required. Designed from ASTM E960, Type II requirements.